Castle Douglas High Street @ High.St - High Street shops and High St businesses. 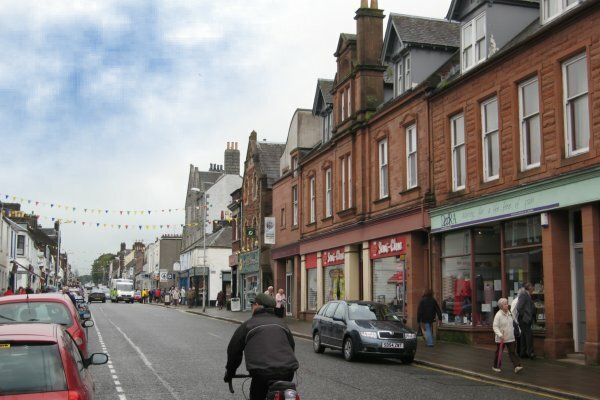 Large Google map of Castle Douglas High St.
Castle Douglas has been surveyed and the shops will be added shortly. You should see a montage of pictures above. If all you see is a black rectangle then the pictures can be seen by downloading a small plugin from Photosynth. This plugin is okay, Photosynth is now owned by Microsoft, and well worth downloading. Dumfries and Galloway is a rural area with some beautiful coastline and forests, including the 300 square mile Galloway Forest Park. The area is easy to reach from England, Wales or other parts of Scotland; there are even ferries from Larne and Belfast directly into Stranraer. The area is also well known for having 2 of the 7 Stanes mountain bike trails on the doorstep: Dalbeattie and Mabie. The official Dumfries and Galloway Tourist Information website has lots of information about events in the area or you can find out more about the local towns of Dalbeattie, Wigtown, Kirkcudbright and Newton Stewart on this site.